It’s important to see the heart of Jesus. In this passage, Jesus and His disciples had taken a moment to get away from the vast crowds so that they could be alone and rest for a while. But the crowds are aware of their departure by boat and they quickly make it to the other side of the lake, arriving before Jesus and the disciples so as to meet them as they do arrive. What is Jesus’ reaction? Does He look at them with frustration? Does He think to Himself, “Oh my, these people do not leave me alone even for a little while?” Most certainly not. His response is one of heartfelt mercy and compassion. He is moved with pity for them and He continues to teach them many things. This happened for a number of reasons. First, it happened as a result of the deep longing that so many people felt. 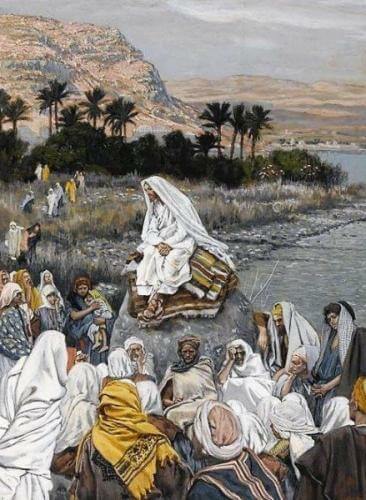 They were drawn to Jesus, to listen to Him and to learn from Him. Secondly, it happened because Jesus also had a deep longing to be with His people. He desired to share His heart with them and to shepherd them, leading them into the many truths He came to reveal. Jesus was a true Shepherd who loved His sheep and welcomed them continually. The same must be true for each one of us. We must all seek to be with Him, love Him and follow His commands. We must diligently and tirelessly seek Him out no matter how difficult that may be. We have a duty, in love, to seek and find our Lord. And Jesus, for His part, will fulfill His duty toward us to shepherd us and teach us many things. He will allow His heart to be moved with mercy and compassion toward us and He will draw us close to Himself. Reflect, today, upon the merciful heart of Jesus. See His heart, long for Him and go to Him. Know of His burning love for you and accept Him as your Shepherd. Lord, I do love You and I give my life to You. I pray that You will always fill me with a burning desire to seek You out, each and every day. I thank You for Your mercy and for Your shepherd’s heart. May I rest close to Your heart every day. Jesus, I trust in You.